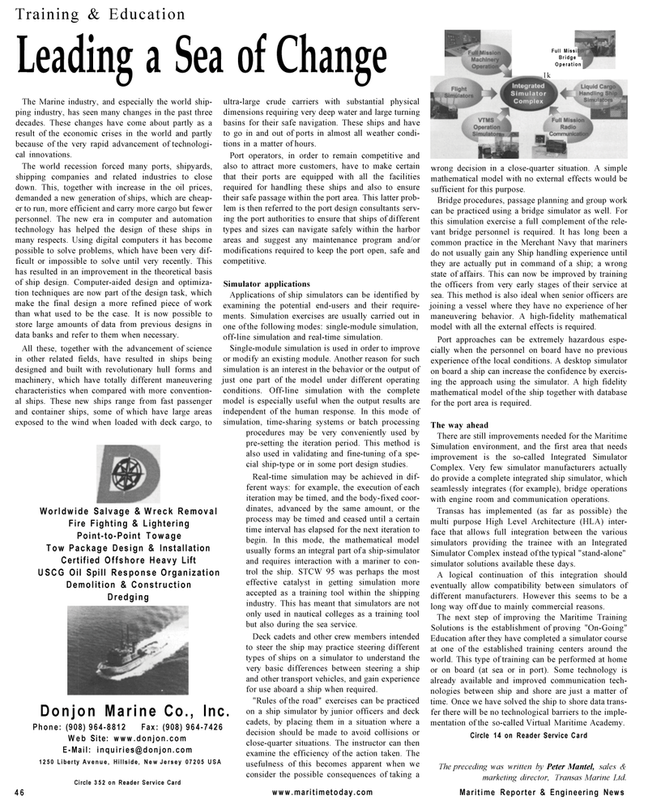 The Marine industry, and especially the world ship- ping industry, has seen many changes in the past three decades. These changes have come about partly as a result of the economic crises in the world and partly because of the very rapid advancement of technologi- cal innovations. The world recession forced many ports, shipyards, shipping companies and related industries to close down. This, together with increase in the oil prices, demanded a new generation of ships, which are cheap- er to run, more efficient and carry more cargo but fewer personnel. The new era in computer and automation technology has helped the design of these ships in many respects. Using digital computers it has become possible to solve problems, which have been very dif- ficult or impossible to solve until very recently. This has resulted in an improvement in the theoretical basis of ship design. Computer-aided design and optimiza- tion techniques are now part of the design task, which make the final design a more refined piece of work than what used to be the case. It is now possible to store large amounts of data from previous designs in data banks and refer to them when necessary. Circle 352 on Reader Service Card 46 ultra-large crude carriers with substantial physical dimensions requiring very deep water and large turning basins for their safe navigation. These ships and have to go in and out of ports in almost all weather condi- tions in a matter of hours. Port operators, in order to remain competitive and also to attract more customers, have to make certain that their ports are equipped with all the facilities required for handling these ships and also to ensure their safe passage within the port area. This latter prob- lem is then referred to the port design consultants serv- ing the port authorities to ensure that ships of different types and sizes can navigate safely within the harbor areas and suggest any maintenance program and/or modifications required to keep the port open, safe and competitive. Applications of ship simulators can be identified by examining the potential end-users and their require- ments. Simulation exercises are usually carried out in one of the following modes: single-module simulation, off-line simulation and real-time simulation. Single-module simulation is used in order to improve or modify an existing module. Another reason for such simulation is an interest in the behavior or the output of just one part of the model under different operating conditions. Off-line simulation with the complete model is especially useful when the output results are independent of the human response. In this mode of simulation, time-sharing systems or batch processing procedures may be very conveniently used by pre-setting the iteration period. This method is also used in validating and fine-tuning of a spe- cial ship-type or in some port design studies. Real-time simulation may be achieved in dif- ferent ways: for example, the execution of each iteration may be timed, and the body-fixed coor- dinates, advanced by the same amount, or the process may be timed and ceased until a certain time interval has elapsed for the next iteration to begin. In this mode, the mathematical model usually forms an integral part of a ship-simulator and requires interaction with a mariner to con- trol the ship. STCW 95 was perhaps the most effective catalyst in getting simulation more accepted as a training tool within the shipping industry. This has meant that simulators are not only used in nautical colleges as a training tool but also during the sea service. Ik wrong decision in a close-quarter situation. A simple mathematical model with no external effects would be sufficient for this purpose. Bridge procedures, passage planning and group work can be practiced using a bridge simulator as well. For this simulation exercise a full complement of the rele- vant bridge personnel is required. It has long been a common practice in the Merchant Navy that mariners do not usually gain any Ship handling experience until they are actually put in command of a ship; a wrong state of affairs. This can now be improved by training the officers from very early stages of their service at sea. This method is also ideal when senior officers are joining a vessel where they have no experience of her maneuvering behavior. A high-fidelity mathematical model with all the external effects is required. Port approaches can be extremely hazardous espe- cially when the personnel on board have no previous experience of the local conditions. A desktop simulator on board a ship can increase the confidence by exercis- ing the approach using the simulator. A high fidelity mathematical model of the ship together with database for the port area is required. Complex. Very few simulator manufacturers actually do provide a complete integrated ship simulator, which seamlessly integrates (for example), bridge operations with engine room and communication operations. Simulator Complex instead of the typical "stand-alone" simulator solutions available these days. A logical continuation of this integration should eventually allow compatibility between simulators of different manufacturers. However this seems to be a long way off due to mainly commercial reasons. Solutions is the establishment of proving "On-Going"
Education after they have completed a simulator course at one of the established training centers around the world. This type of training can be performed at home or on board (at sea or in port). Some technology is already available and improved communication tech- nologies between ship and shore are just a matter of time. Once we have solved the ship to shore data trans- fer there will be no technological barriers to the imple- mentation of the so-called Virtual Maritime Academy. The preceding was written by Peter Mantel, sales & marketing director, Transas Marine Ltd.